← Solar Prethermography, a new Enerconcept benefit! Most of you know the Lubi solar hot air collector, which not only broke all records in terms of thermal performance, but now offers architects unparalleled opportunities in architectural integration. The principle of the Lubi system, which uses perforated glazing as a mean to heat the air using solar radiation and heat recovery, is now officially patented in Canada. 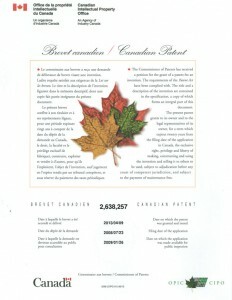 Canadian patent no. 2,638,257 was granted to Solutions Énergétiques Enerconcept on April 9th 2013 and will be valid until 2028. The patent application was filed in Canada in 2008, after very conclusive internal testing, which already showed much higher results than all other principles previously applied. Unlike the current practice of the last 20 years which uses perforated metal walls, the transparent coating lets solar radiation pass through so it is transformed into heat. The collector, which is almost insensitive to winds, maintains its very high performance even in harsh climates like Canada. On the other hand, the perforated glazing collector can still remain very efficient even with a light coloured absorber giving architects and designers an unrivaled choice. In fact, tests performed by a SRCC * laboratory show that the perforated glazed collector has a performance 20% higher than the black metal collector and 58% higher than a white metal collector. Enerconcept, whose Lubi collector finds new markets around the world, will not stop here and intends to continually improve its products by designing clean and cost effective applications for solar hot air heating.